The strength of Interfaith Ministries for Greater Houston (IM) lies in the selfless contributions made by our dedicated corps of volunteers. Each year, more than 4,000 volunteers lend their time and talents toward helping refugees and homebound seniors who turn to IM for help. Make an IMpact in your community by signing up to volunteer today! Read about our ongoing opportunities described below. During orientation, you will receive a detailed description of our available volunteer opportunities and complete the necessary volunteer paperwork. Volunteer orientations are held two times a month. To register for an orientation, please RSVP to one of the dates offered at the end of the Volunteer Application. Once you have completed the online application and attended New Volunteer Orientation, you will be ready for Training. Trainings are offered anywhere from once/month to once/week, depending on the program. At New Volunteer Orientation you’ll be able to select your volunteer preferences and will be sent training date information and details after your volunteer application has been successfully processed, processing usually takes about 1 week. Please know that if you indicate your interest in volunteering for any Refugee Services opportunities you will also be scheduled for a one-on-one interview to determine your best match. Once you have completed the online application and orientation as well as your training, you are ready to serve in your volunteer role. From application to first day volunteering can take a few weeks but this is the best process to fully vet each volunteer. Help provide 11,000 holiday meals for seniors! Want to deliver hot meals to Houston seniors on Thanksgiving Day? 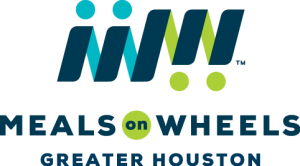 Over 4,300 seniors in the Houston/Galveston area rely on IM’s Meals on Wheels program every day. Most of these seniors are still recovering from Hurricane Harvey and need our help more than ever. They need you to bring them a little extra holiday cheer along with their traditional Thanksgiving meal! Thank you for caring about seniors in need. Together, we can make sure that no senior goes hungry, on Thanksgiving or any other day! aniMeals on Wheels Delivery Driver: Once a month help to deliver aniMeals pet food to Meals on Wheels clients. aniMeals on Wheels Donation Pickup Driver: Support the aniMeals on Wheels program by picking up pet food and supply donations from designated vendors, on a route designed by aniMeals on Wheels staff. The aniMeals on Wheels Delivery and Pickup routes are perfect for someone in need of a flexible volunteer opportunity. IM offers a number of convenient weekday and Saturday time slots for volunteers to make their pet food deliveries or donation pickups. Where do you need volunteers? aniMeals on Wheels routes typically have 4-6 stops that are located close together. Currently, there are routes throughout our entire service area including Harris County and Galveston County. Volunteers are assigned to routes as they become available. We cannot guarantee that a route will always be available in your preferred neighborhood but we work with each volunteer to find a route with which they are comfortable. Is this opportunity Family Friendly? For info, contact Cecilia at cpham@imgh.org. At Meals on Wheels, one of our aims is to help clients remain safely in their homes for as long as possible. Unfortunately, some clients lack the ability to complete everyday chores. Volunteers who participate in Chore Corps help Meals on Wheels clients maintain their independence and help combat isolation. 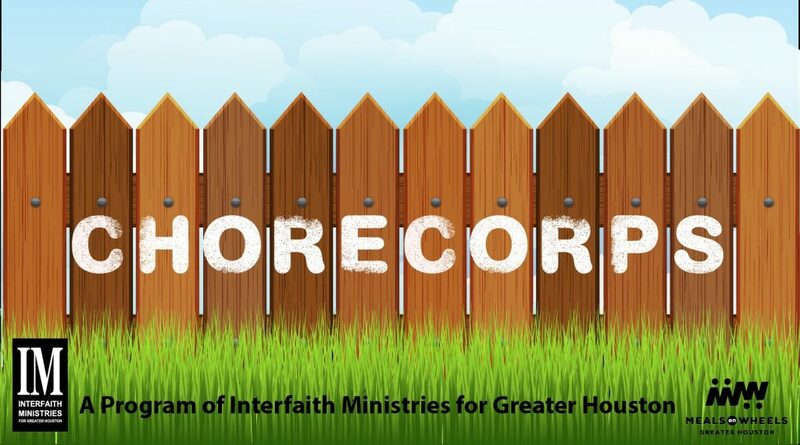 Chore Corps is perfect for someone in need of a flexible volunteer opportunity. Chores can be completed in the evenings or on weekends as long as it is convenient for both client and volunteer. Currently, Chore Corps is limited to clients within the 610 loop. Volunteers may sign up for chores based on client’s zip code. Do I need any supplies for this opportunity? Certain Chores may require tools to complete them; for example, clients may not have a working lawn mower, in which case a volunteer is permitted to use his or her own. Volunteers are notified about supply/tool needs prior to signing up for that chore. 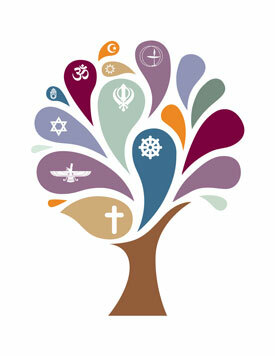 Interfaith Ministries takes great pride in serving the diverse refugee community in the Greater Houston area. We have a number of volunteer opportunities directed at helping to welcome and resettle newly arrived refugee families and individuals. Family Mentor: Volunteers are assigned to a refugee family or client with the purpose of serving as cultural mentors. The number of volunteers assigned to a family may vary depending on size and circumstance. Activities may include exploring the city, practicing English, and teaching clients about public transportation – anything that involves sharing local culture and customs as clients acclimate to their new lives in Houston. Time commitment: 1-2 hours every week or every other week for approximately 6 months. Employment Mentor: Volunteers will work with a specific client to assist with resume writing, practicing interview techniques, discussing US culture, helping fill out and submit job applications, and if available, transporting the client to and from the job interviews. Time commitment: 2-3 hours weekly or bi-weekly, until the client is hired. Case Management: Volunteers assist with the ongoing needs of refugee clients & caseworkers – airport pick-ups, school registrations, transportation to and from DPS and Social Security offices and other assignments as needed. Volunteer opportunities often occur on short notice. Time commitment: requires schedule flexibility as many of the activities where help is needed the most occur during business hours. Medical Case Management: Volunteers work closely with medical case managers to assist clients regularly attending health-related appointments. Activities may include transporting the client to and from appointments, accompany clients during clinic visits, translating, demonstrating how to fill a prescription at a nearby pharmacy, etc. A medical, health or social work background is an asset for this position. Proficiency in relevant languages (Arabic, Farsi/Pashto, and Swahili) is especially advantageous for this position. Time commitment: requires schedule flexibility as many of the activities where help is needed the most occur during business hours. Special Events/ Projects: Volunteers assist Refugee Services staff with special events and projects throughout the year. Some of the events include the annual scholarship luncheon, Women’s Group, our annual fundraising luncheon, storage unit clean up, etc. Time commitment: some events and projects take place during the day and some after work hours or on weekend. Translators: Volunteers assist clients, caseworkers or other volunteers and community members with translation either in person or by phone. Language needs are diverse but we have recently utilized Arabic and Swahili translators. Time commitment: depends on the need, during the regular business hours as well as events and weekends. Do I need any special skills or training for these opportunities? You may think that you need to speak multiple languages or have previous experience to be a volunteer in Refugee Services. This is not the case at all! We just ask that volunteers are patient, flexible, and reliable. In fact, we prefer to partner refugees with volunteers who do not speak their native language in order for refugees to practice English. Most of our refugees are resettled in the Southwest area of Houston, a global community that is also convenient for our Refugee Case Managers to travel to. Since most of our refugees do not have vehicles, our volunteer opportunities are limited to the refugee’s residence or our IM headquarters located at 3303 Main Street Houston, Texas 77002. Since most of our Refugee Services volunteer opportunities involve working one-on-one with the client(s), volunteer shifts may vary. Many of our Refugees who have found work will need to meet in the evenings or weekends, while some may be available during the day. Individual Refugee Services Volunteers must be 21 years of age. Some of our opportunities may be appropriate for a family to participate in. Because our Refugee Services volunteer opportunities are not for everyone, individual interviews are scheduled prior to training and volunteer placement. For info, contact Elena at ekorbut@imgh.org. Special Events Volunteer: IM holds large and small events throughout the year to help raise funds to support our programs, spread awareness or recruit new volunteers. Special event volunteers may help by setting up an IM fundraiser, going to a fair, or representing IM at a recruitment event. Special events may be weekday, weekend or evenings. Administrative Team: Volunteers help with miscellaneous administrative tasks, such as filing, data entry, and answering phone calls. Larger projects may also be available. Administrative opportunities are available throughout IM. Opportunities are available weekdays from 8am-5pm and Saturday Mornings. Group Supervisor: Are you a natural leader? Are you a coach/teacher? Take on a leadership role by providing training and supervision to onsite groups. Opportunities to lead groups, from large corporations to small local chapters, faith based or youth, occur on weekdays from 8am-5pm and Saturday Mornings. As with all of our volunteer opportunities, training is required and provided by IM staff but you don’t need any previous experience or special expertise to help with these projects. For each of these opportunities you’ll have a one-on-one meeting with a staff member to determine the best fit. Administrative Team & Group Supervisors volunteer exclusively at W. T. and Louise J. Moran Meals on Wheels Building, 3202 San Jacinto Street, 77004. While Special Events Volunteers are usually assigned to events that take place at various locations. Meal Delivery: Volunteers pick-up hot, nutritious meals during lunchtime (Monday – Friday) and hand-deliver them directly to the homes of seniors and persons with disabilities. Pick up times are between 10:30-11am from of one of five Interfaith Ministries distribution sites. Deliveries typically take about 1-1.5 hours to complete. Volunteer Coordinator: Coordinate meal distribution for volunteer drivers at an assigned distribution site. Volunteer Coordinator shifts are Monday-Friday from 9am-Noon. Warehouse Crew: Work with warehouse staff and volunteers to organize and pack meal components including hot meals, sides, and beverages to be delivered to Meals on Wheels clients. Shifts are Monday-Friday from 8am-11am. This opportunity is only available at our Midtown location. Where do you need Meals on Wheels volunteers? Meals on Wheels Delivery volunteers use their own vehicle for deliveries. Two small coolers are also needed for Meals on Wheels deliveries (1 for cold food items, and 1 for hot food items). Reusable insulated grocery bags are offered for daily use to volunteers by IM, or volunteers may choose to bring their own coolers. Can’t commit to volunteering at this time but still want to help? Consider some of the following options to stay involved!